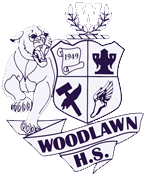 Woodlawn High School is proud to announce Alisa Webb as the 2017-2018 Woodlawn High School Student of the Year. Alisa Webb has distinguished herself as a scholar and leader at Woodlawn High School, where she is part of the Academically Gifted and Talented Music Programs. Currently ranked second in her class, she has maintained straight As every semester of high school and has taken some of the most challenging courses that Woodlawn High has to offer. Her list of achievements include being named an AP Scholar with Distinction, receiving the Tulane Book Award, and being selected to the All-Parish Honor Band. She believes that through hard work, determination, and passion, she has been able to achieve her academic and personal goals. It was through hard work that she was selected as the first female Drum Major in over a decade at WHS this year, as well as the Team Captain of the robotics team last year. Her talent and leadership has led the band to victory in state competitions, and no football game would have been complete this year without Alisa leading the band on Friday nights. As Team Captain and Field and Pit Coordinator of the robotics team during her junior year, she helped the team qualify for a spot at the national competition last year and showed female students that they can be leaders in a male dominated field. She is involved in multiple clubs on campus, including Beta, National Honor Society, and Key Club. Through these clubs, she is able to fulfill her passion of giving back to the community. Some of her most recent contributions were serving on the committee for the First Annual Woodlawn High Masquerade Mardi Gras Ball, promoting the district Recycling Campaign that Woodlawn High School won, visiting retirement homes to deliver Christmas cards to residents, and participating in a supply drive for hurricane flood victims this year. She has served as a face of Woodlawn High at multiple recruitment events and volunteers her time tutoring peers and mentoring future Panthers. She is also the founder and President of the Astronomy Club; the team plans to compete in the Team America Rocketry Challenge this year.